Chinese legends often depict figures carrying gourds—divine doctors used them when treating patients; Tieguai Li, one of the Eight Immortals of Taoism, always had a golden gourd slung over his shoulder; and the eccentric monk Ji Gong never let his wine gourd leave his side. 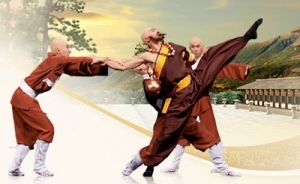 The drunk monk Lu Zhishen, who starred in a 2011 Shen Yun dance, had a gourd strapped to his hip. Chang’e, who featured in a 2007 Shen Yun number, drank a magic potion from a gourd and flew to the moon as a result. The gourd is a type of climbing plant from the Cucurbitaceous family, which also includes squash and melon. Fresh gourds are covered with a tender green skin and are eaten as vegetables. Mature gourds have a golden yellow hue. Ancient people fashioned gourds into snuff powder bottles and flower vases. They were also used as containers for water, medicine, and liquor. Bottle gourds have the ability to preserve the taste of wine for a very long time. Ancient medical books recorded that gourd-bottled wine could relieve inflammation, improve eyesight, and help digestion. In feng shui, gourds are believed to have the power to expel evil spirits. The Chinese word for gourd—hu lu—is a homophone of the words ‘protection’ and ‘good fortune.’ That may have been the reason why the ancients considered gourds to be good luck charms, hanging them over doorframes or carrying them to ward off evil.